I am running the Indiana Trail 100, on April 25-26. I will be running for CANDLES Holocaust Museum and Education Center in Terre Haute. It was founded by, Eva Mozes Kor, an Auschwitz and Dr. Mengele Twin Experimentation survivor. I am asking for pledges per mile for my race. Please help me help CANDLES! Thank you for your consideration! Blessings! The photo was taken at Auschwitz I during our trip on January 29, 2015. This enlarged photo show Eva and her twin sister, Miriam at the front. Ironically, she is pointing to herself and I am to the right - also a twin. 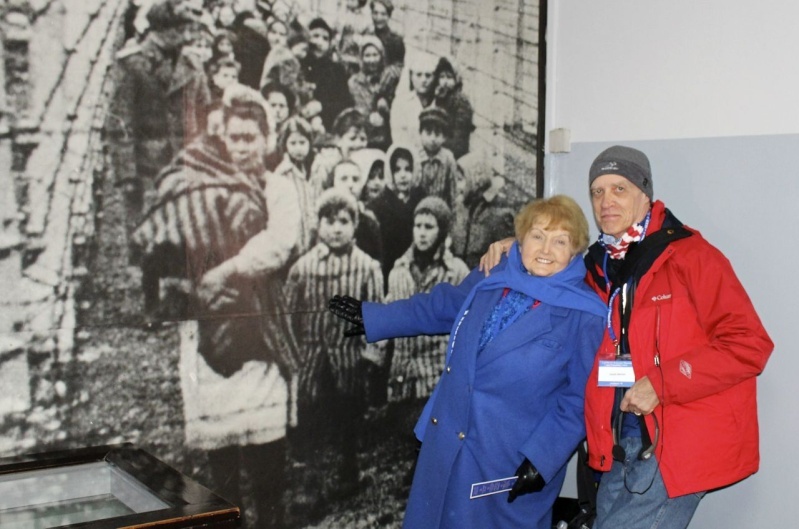 This photo is on permanent display in one of the block buildings at Auschwitz I. When she is doing photos like this, other tour groups see her and get very excited. Eva is a rock star there and people buy her book there at the bookstore and often stop her to get it signed and get a photo. She is gracious and sweet to everyone. Everyone. On Thursday of our trip, I had breakfast with Eva and she really cares and asks questions. She is concerned I run too much and she caught me on Friday when I came in the lobby after a 15-miler along the river in Krakow. She wanted to know if my joints felt OK! CANDLES Holocaust Museum is not just all about the Holocast. Yes, she shares her story of their time there and surviving Dr. Mengele. But she now focuses her efforts speaking about the power of forgiveness, anti-bullying, never giving up and much more in her talks there to children and adults, as well as speeches all across America. Recently, she was at IU Southeast in New Albany, Indiana for a speech. I was there and spoke to the crowd a little during the Q & A. The auditorium was full and two overflow rooms with a video feed and they still could not accommodate everyone. It was the largest attended speakers event in the history of the campus. She sat in the lobby afterwards, where huge lines formed and Eva signed her book, "Surviving the Angel of Death" for over THREE HOURS and she is 81 years old. Most people find her to be one of the most compelling and inspirational speakers they have ever heard. She makes a difference, because she is a survivor, not a victim. That is why I am supporting her and because I just simply love her.